Rinca was known as Komodo Island, but not a few travelers who visited the island of Rinca. The reason other than the distance from Labuan Bajo closer, aka Ancient Naga population komodo island is also more. Lets adventuring to Rinca Island! Located in West Manggarai Regency, East Nusa Tenggara, Komodo dragons live in four places are included in the Komodo National Park, the island of Komodo, Rinca, Gili Motang, and Nusa Kode. It takes about 2 hours away by boat to arrive at the gateway of Rinca Island, Loh Buaya or Teluk Buaya from Labuhan Bajo. Island area of 19 thousand hectares has extant populations reached 2,318 tails or more if compared to Komodo Island only 2,126 individuals. 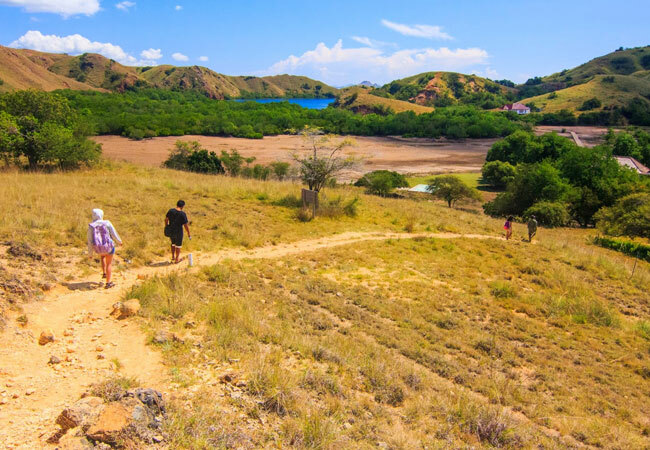 Although already reached the island of Rinca, there are also tourists who do not feel satisfied if you have not set foot on the island of Komodo. Rinca island has a stunning natural expanse. There is a three-meter Komodo dragon statue not far from the pier. The view on Rinca like in a desert savanna, although barren and arid but beautiful. However, it was not long arid landscape, the next is already a lot of mangrove trees adorn this ancient dragon habitat. Once inside the gates "Welcome", just a few meters from the entrance, the dragons have been welcome. They are under the house and the kitchen of the ranger. Many komodo dragons in this area because of the smell of fish meal they gathered. The smell of this predator very sharp. Komodo able to smell up to a distance of 5 km. For women who are menstruating please notify ranger, because it is very dangerous and should be kept within the group. There are a couple of tracks or routes that can be selected travelers, from short track, medium, and longest track. Each of these tracks is between 2-8 km and takes about 1-3 hours. In the middle of the track, a ranger will show Clutches. Clutches shaped hole with a depth of about 2 meters. This is where the giant lizard spawn. For those who like adventure challenge, suggested choosing the longest track. Chances are you will encounter dragons of various sizes, as well as the larger course. After seeing the dragons, it is better not to miss any single inch of scenery and enjoy the charm of the island. Up into the hills can add its own energy. A collection of rocks and weeds adds to its beauty. Especially if the weather is nice and the support would not be enough taste to explore the beauty of the island.